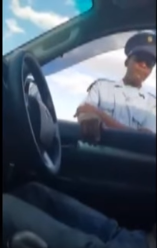 A member of the Namibian Police has been spotted along the Western Bypass road in Windhoek stopping vehicles and asking the drivers and occupants for money. This is not the first time this specific person disgraced the uniform of the Namibian Police and the office he swore to uphold in such a scandalous manner. During November last year and almost at the very same spot he was caught doing exactly the same. During the previous incident last years the officer wore bright orange sleeves usually worn by traffic officials when on duty on the roads. Shortly after the incident a few months ago a criminal case was laid against the officer in question and that matter is still pending in the Windhoek Magistrate’s Court. 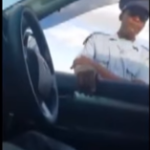 During the latest incident the inebriated officer asked motorists for money to pay for a taxi to take him to the Hosea Kutako International Airport in order for him to report for duty. It seems that he already missed one of his shifts due to his intoxicated state. This is not the first time members of the Namibian police are implicated in criminal activities. In Oshikango on the northern border of Namibia, some officers have been implicated in continuous illegal fuel smuggling activities.